Possible Dreams® Santas Possible Dreams Creative Director, Ann Dezendorf, has designed and art di.. Standing watch on a calm brisk day, the young deer waits for his friends to finish their drink. Meas..
Possible Dreams Creative Director, Ann Dezendorf, has designed and art directed Clothtique™ Santa figures since 2003. Ann's hand-made, unique and mixed media themed Santa figurines bring family memories and holiday traditions to life. Says Ann: Possible Dreams' figures have become more sophisticated and complex every year. I keep pushing the sculptors to add more detail or facial expressions; and development teams to try new techniques, like embroidery or lighting. Since I work in mixed media, it is a challenge for molding, shrinkage and assembly. And since these are handmade, they are very labor intensive. The Clothtique stiffened fabric and mixed media details are makes these Santas come to life. We welcome you to view each Santa from every angle; feel the textures and be surprised with the personalities of each Santa of his friends. Possible Dream Santas range in height from 8 to 12 inches (20-30cm). 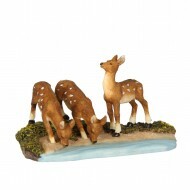 They are hand sculpted and painted to bring out realism and personality. These are timeless collectibles touching on Christmas traditions and lifestyle.